Here is what we do with TEDxHimi Curation Team. Today, let us share with you a part of the activities of Curation Team. What Curation Team does is to dig out speakers. We are searching speakers who are great, energetic with passion, and simply nice, in order to spread their “ideas worth spreading” from TEDxHimi. Curation Team members are based in Tokyo although TEDxHimi is to be held in Himi, Toyama*. The reason why they support the preparation and everything all the way from Tokyo is that simply they live there. So why they involved with TEDxHimi from that far? 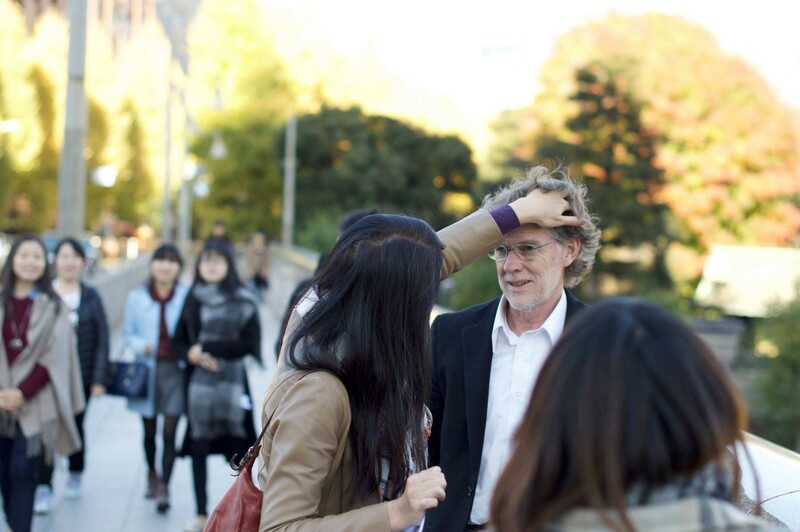 It is because everything started with a person who got sympathized with the policy of TEDxHimi, and he was in Tokyo. We have selected the twelve speakers after careful selections considering the match with TEDxHimi. Please look forward to our TEDxHimi and how “ideas worth spreading” will be spread out! The person in the photo above is Mr. Simon Wearne. He lives in Wakayama** so it is kind of rare to see him, but that day he came to Meiji University in Tokyo to attend a conference, and so we shot his profile photo in between his busy schedule. Simon is a cinematographers with many awards, so he is a leading professional in photography. He threw us precise advices of, for example, how to best light up using our reflector (this has a reflective surface and is used to redirect lights toward a specific object). What we could do in that situation was just to set his hair style! He preferred ‘fluffy’ style so we captured a shot of us fluffing out his hair! Like in this way we are preparing for TEDxHimi, meeting speakers every week (or sometimes every day). *Himi in Toyama prefecture is located along the Sea of Japan, about 275 km away toward the northwest from Tokyo. **Wakayama is located near Osaka, about 445 km away toward the southwest from Tokyo.